As the ultimatesource of all the energy on Earth, the sun has an inextricable hand in driving ourplanet's climate and atmosphere. But a new look at the sun's connection toEarth's climate has returned some surprising results. The study findsthat during the most recent lull in the sun's weather cycle, the amount ofenergy that reached Earth increased, instead of decreasing as predicted. Theplanet may have experienced a slight warming effect as well, researchers said. The study,led by Joanna Haigh, a professor of atmospheric physics at the Imperial CollegeLondon,?analyzed the types of radiation that reach Earth from the sun, and thevarious effects they have on ourplanet's atmosphere. Haigh andher colleagues used satellite measurements taken from 2004 to 2007, thedeclining phase of the latest 11-year solar weather cycle. As the sunbecomes less active, it typically releases less energy in the form ofradiation. Previously, this was understood as a decrease in the total amount ofradiation that reaches the top of the Earth's atmosphere. In examiningsolaremissions during this declining phase, however, the researchers found that alarge decrease in ultraviolet radiation was roughly compensated for, by anincrease in visible radiation. "Visibleradiation is the only kind that, in any substantial quality, gets to theEarth's surface and heats the lower atmosphere," Haigh told SPACE.com. "We found that as the sun's activity declined from 2004 to 2007, more ofthis radiation was entering into the lower atmosphere." Ultraviolet radiationis largely absorbed in the stratosphere, where it combines with ozone moleculesto form what is known as stratospheric ozone. As stratospheric ozone depletes,more UV radiation is able to pass through to the Earth's surface. Visibleradiation, on the other hand, more readily penetrates into the Earth's loweratmosphere. So, if more visible radiation reaches the Earth's surface, theheating of our planet's lower atmosphere results in a warming of the climate. "Injust over three years of observation, we conclude that the visible radiationwas going to be warming the planet as the solaractivity declined," Haigh said. This mayseem counterintuitive, and the researchers are careful to note that theirfindings cannot be generalized without more extensive study of these processes.Furthermore, they said, their observations were made over a relatively shortperiod of time during a potentially anomalous solar cycle. Theirresearch is detailed in the Oct. 7 issue of the journal Nature. An extremelylong stretch of low solar activity in recent years has baffled scientists, and theexpected minimum of solar activity between 2008 and 2009 was unusually quiet. The ebb andflow of the sun'smagnetic activity, and the amount of energy it puts out, make up the solarcycle. Typically, a cycle lasts about 11 years, taking roughly 5.5 years tomove from a solar minimum to a solar maximum. The totalenergy that reaches Earth from the sun varies by only 0.1 percent across thesolar cycle, and atmospheric physicists and meteorologists have struggled tolink such a small variation to the ups and downs of Earth's natural weather andclimate patterns. "In thepast, it was thought that the changes were too small to do anything,"Haigh said. "People knew there was a UV component that was heating thestratosphere, but it was thought to be unimportant to the climate." The findingsof this new study, however, could be a step toward piecing together the puzzle. "Thesun has been behaving very strangely over the past few years," Haigh said. "We need to know more about how strange it is before we extrapolate thefindings to other periods of time. But it does suggest that our previousunderstanding of how the sun affects the Earth's climate may be in need ofrevision." There ismore work to be done, Haigh said. Now that thesun has presumably awoken from its solar minimum, scientists are keen toobserve the star as it ramps up its activity. "It'llbe very interesting," Haigh said. 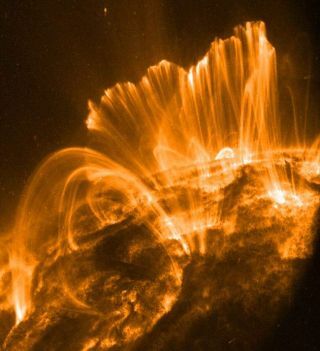 "If the visible radiation starts todecline as solar activity goes up, that would be very, very interesting." These typesof studies will be an important part of the discourse on climate change. Beingable to gauge the influence of solar activity on our climate and atmospherewill be crucial to the ongoing debate, Haigh said. "It'squite clear that we have to understand what the sun does to our climate and howmuch more or less solaractivity affects the atmosphere," she said. "We need to work outthe solar component of climate change." "Thisis not at all to suggest that the sun is causing climate change, but I do thinkwe need to accurately know what the sun is doing, so that we can better assessthe human component."